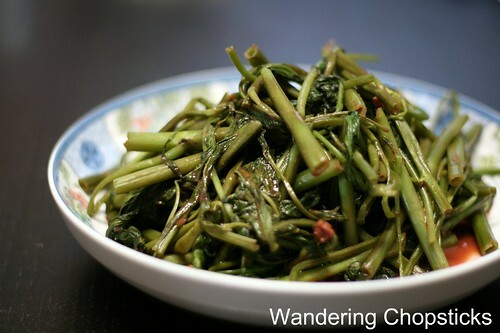 I love rau muong (Vietnamese water spinach) or ong choy in Chinese. It's also called morning glory and empty-hearted vegetable on account of the hollow stems. Crunchy. Refreshing. Loaded with vitamin A. It's native to Southeast Asia, and is considered poor man's food in Vietnam because it grows plentifully in swamps. Rau muong is readily available in Asian grocery stores, quite inexpensive, and cooks in minutes. The hardest part is taking the time to pluck the hollowed stems into sections. Pluck by hand to keep the leaves whole. I like it best stir-fried with chao/doufu ru (Vietnamese/Chinese fermented bean curd). A little goes a long way, so just one or two cubes of these salty, flavor-packed cubes of fermented tofu is all you'll need. 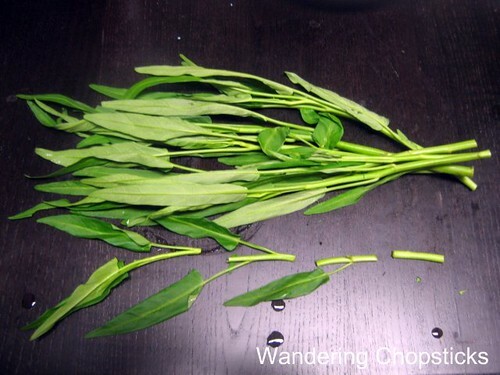 Water spinach has long, arrow-shaped leaves. The stem has segments. Just remove the bottom few inches of stem, where it can tend to be woody. Save those to make Rau Muong Chua (Vietnamese Pickled Water Spinach) if you'd like. 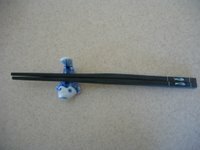 Separate the rest into 2- or 3-inch segments. Wash and set aside. On high heat, in a wok or saute pan, add garlic to a small amount of oil. When garlic is softened, add fermented bean curd cubes and mash with a spoon. Add rau muong and toss so that garlic and fermented bean curd are evenly distributed. Rau muong should only take a few minutes to just wilt and will reduce greatly in volume. That's it. Now, let's just see my original photo. OK, it wasn't as bad as some others, but still could stand some improvement. oh, we like cooking this w/toasted shrimps powder & tiny dried shrimps..yummy !! 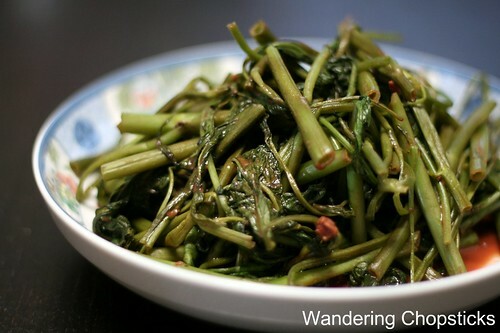 I just stir fried some vietnamese spinach, called mong toi, you ever tried that ? I tried making it Malaysian way but it didn't turn out as good. 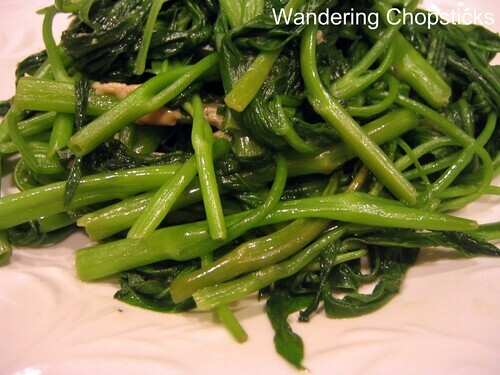 Water spinach is the only VNese spinach I know. Did you take pictures? I've never heard of that vegetable. I'd have to see it. Poor mans food is always the best food. Rich man doesn't know how to eat. We always cook this with sambal belacan. Have to try it with fermented bean curd! We even have this here...though, it's actually pretty expensive - I guess b/c it has to be shipped in from who-knows-where. I'll have to try it with the bean curd, previously I've made it with just garlic, butter, and salt. Thanks for the recipe! This is seriously one of my favorite dishes of all times! It always remind me of home. That's a very classic Malaysian way of stir-frying water spinach. Really? It usually only runs a few bucks here for a big bunch. Me too. I can easily just eat a big side of this with rice.